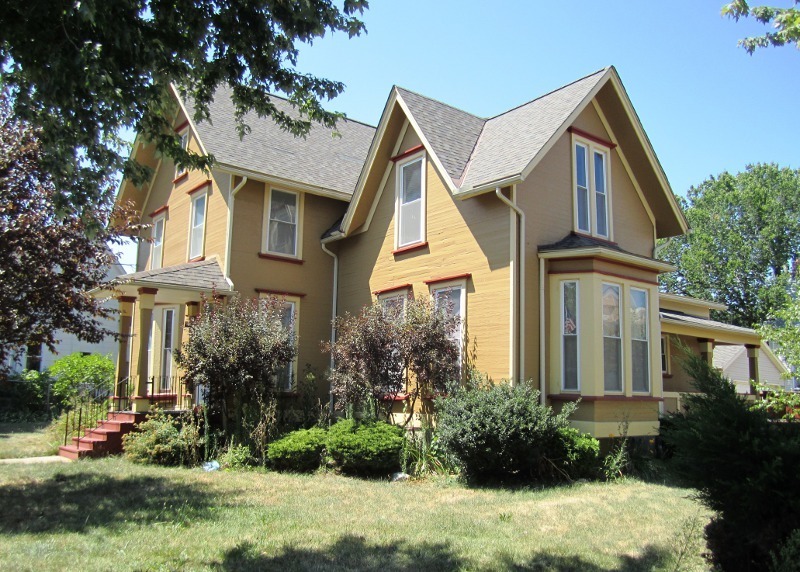 The Oliver Alger House was built by one of the village of West Cleveland's most popular mayors. 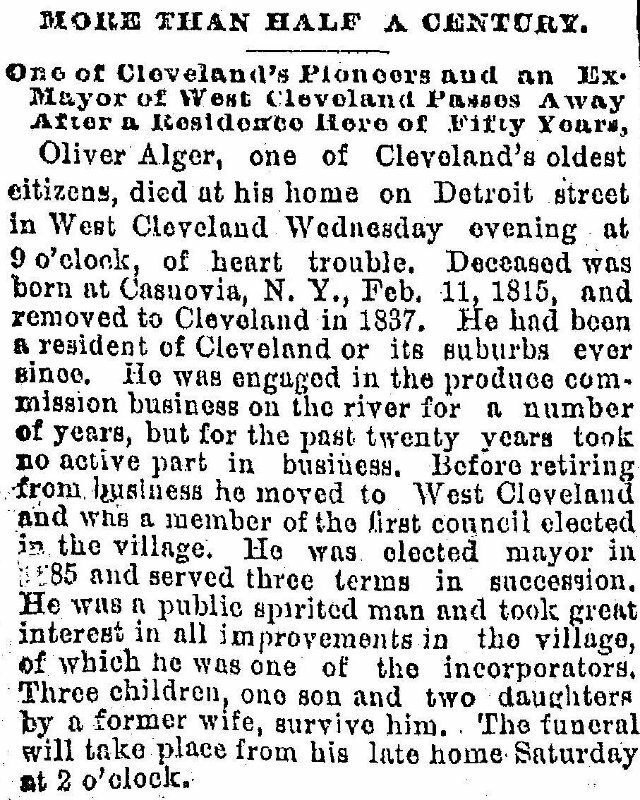 A successful commission agent in Cleveland before becoming a gentleman farmer, Oliver Alger served as mayor of West Cleveland for six years--longer than any other mayor of the village which was annexed to the City of Cleveland in 1894. Alger's house, which in the late nineteenth century was one of the grandest mansions on Detroit Avenue, was saved from the wrecking ball in 1998 when the Detroit-Shoreway Community Development Organization arranged for it to be moved to the northwest corner of Franklin Boulevard and West 77th Street. 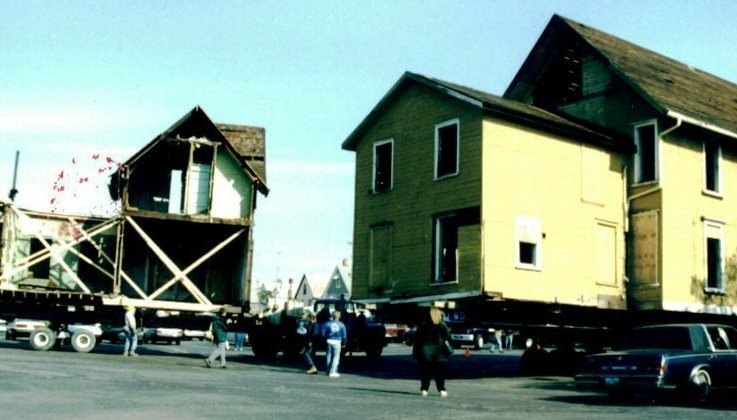 (Interestingly, the house had been moved one time before--about forty feet west of its original site when West 67th Street was extended north to Detroit Avenue in the early 1900s.) The house is now one of the historic grand houses in the Franklin Boulevard-West Clinton Historic District of Cleveland. In a strange twist of post-mortem fate, it was not only Oliver Alger's Detroit Avenue mansion that was moved twice after his death in 1891. In 1894, the Village Town Hall for West Cleveland where Alger presided as Mayor from 1883-1889, was moved by Irish immigrant James Faeron to a vacant lot on West 69th Street and then moved again in 1911 to its present location on Herman Avenue when the City of Cleveland extended Herman Avenue west from West 67th to West 69th Street. And even more strangely, fate bestowed yet one more after death move on Oliver Alger--one which has impacted his legacy not only as the most famous and popular mayor of West Cleveland but also as a local horticulturalist who was so talented that his farm was visited in 1867 by an editor of a national journal devoted to horticultural interests. 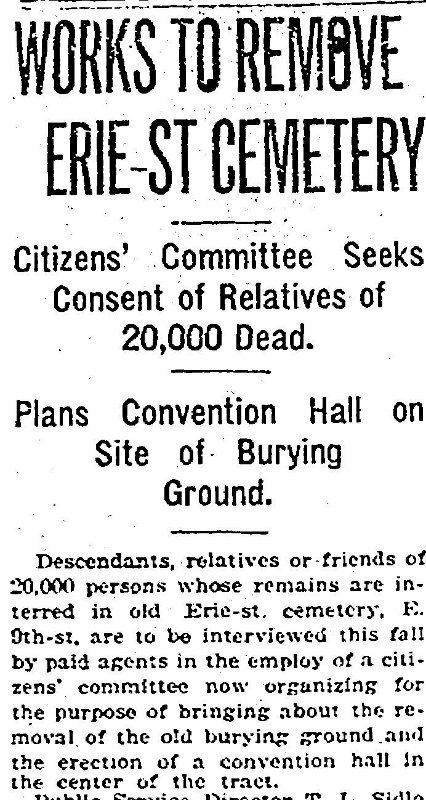 In 1915, less than three decades after Alger's death, the City of Cleveland, as part of a plan (which never materialized) to build a convention center on the Erie Street Cemetery grounds, removed the remains of hundreds of people from the cemetery and reinterred them at Highland Park Cemetery. Among the remains removed were those of Oliver Alger and his wife Mary and their infant son who had been buried in a vault on the northeast corner of the cemetery. At Highland Park Cemetery, Oliver Alger's remains, as well as those of his wife and their infant child, are entombed under a nondescript patch of grass that lies between two monuments--one erected to a man named James Miller and the other to man named Enoch Collier. 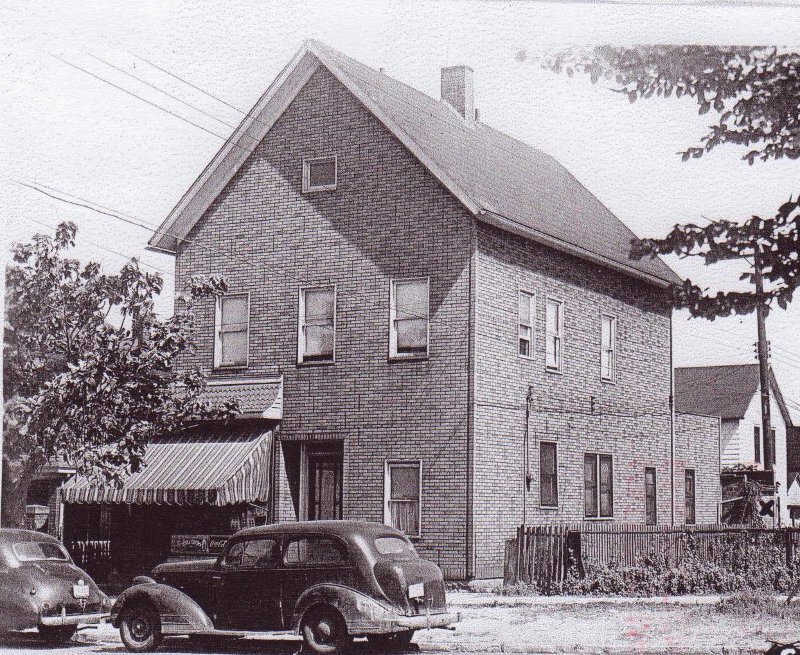 Today, residents and visitors to Herman Avenue near West 69th Street are reminded of the history of the Village of West Cleveland by the former town hall building that now sits at 6702 Herman Avenue. The 1998 relocation of Oliver Alger's mansion from Detroit Avenue to Franklin Boulevard reminds residents and visitors of the grandeur of nineteenth century Franklin Boulevard which was arguably second only to Euclid Avenue's Millionaire's Row as Cleveland's most prestigious residential avenue. 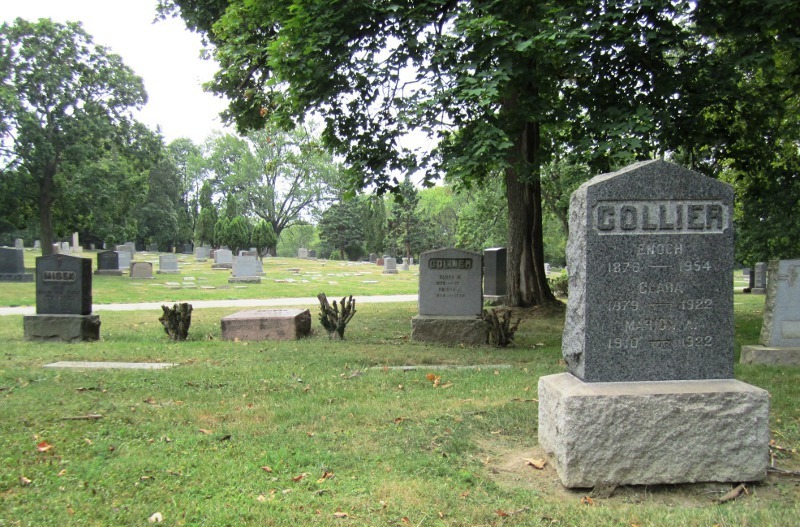 But a visitor to the southern tip of Section 2 in Highland Park cemetery where Oliver Alger is buried will find nothing there--not even a faded stone, as a memorial to one of West Cleveland's most popular mayors and one of Cuyahoga County's pioneer horticulturalists. A Pioneer Horticulturalist: Oliver Alger was a pioneer horticulturalist who experimented with vines and plants on his farm. 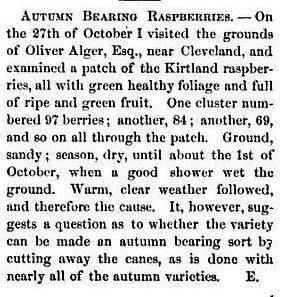 In 1867 an article appeared in the national "Horticulturalist and Journal of Rural Art and Rural Taste," commenting positively on the raspberry patch one of their editor's examined on Oliver Alger's Farm "near Cleveland." Not to be outdone by her husband, Alger's wife Mary grew prize-winning Dahlias in her garden on the farm. 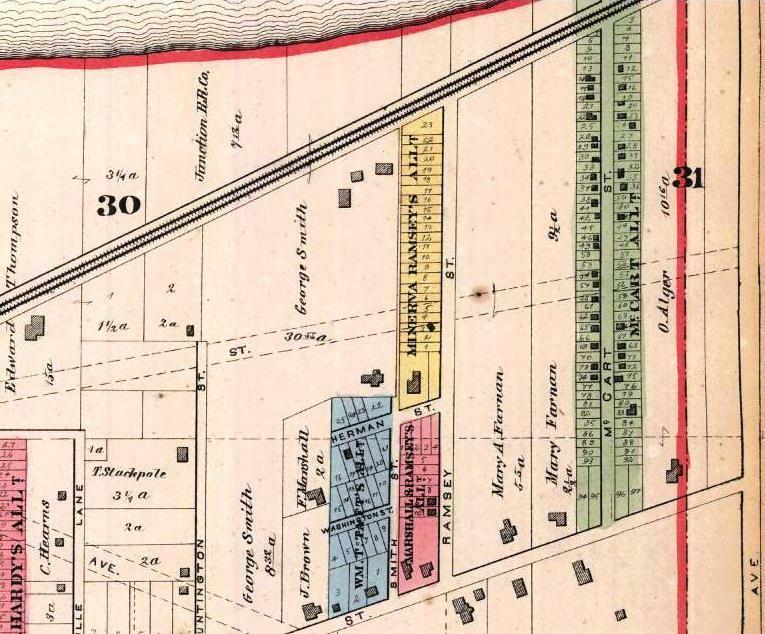 Death of a Cleveland Pioneer: Oliver Alger died in 1891 at the age of 76. In this article from the January 18, 1891 edition of the Cleveland Plain Dealer, Alger's public service to his community was lauded. Alger was buried in Erie St. Cemetery in downtown Cleveland. Image Courtesy of Cleveland State University. Michael Schwartz Library. Division of Special Collections. Jim Dubelko and Raymond L. Pianka, “Oliver Alger House,” Cleveland Historical, accessed April 19, 2019, https://clevelandhistorical.org/items/show/526. Published on Jul 25, 2012. Last updated on Apr 12, 2018.